Sleep is a key factor in maintaining your health and well-being. Not only does a good night's rest allow your body to repair itself, it also helps regulate the growth of organs, bones and muscles, according to sleep experts. Sleep also helps our immune system to cleanse the body of toxins that build up while we are awake and it helps brain function by promoting learning and the consolidation of memories, experts say. A good night's sleep is particularly important for children and youth. And while many kids do get a good night's sleep, research shows that some do not. For example, the 2016 Report Card on Physical Activity for Children and Youth notes that as many as one third of children between the ages of five and 17 do not get the sleep they need to maintain their health and well-being. The picture is worse for teens 16 to 17 years of age - nearly one in two are not getting enough sleep. In addition, the report card says that kids overall are sleeping about 20 to 60 minutes less than they did a few decades ago. Hyperactivity, impulsiveness and a short attention span. Struggles with verbal creativity and problem solving, and generally lower scores on IQ tests. Adverse hormonal changes like those associated with increased risks of obesity, diabetes and hypertension. Possible higher rates of depression and suicidal thoughts. 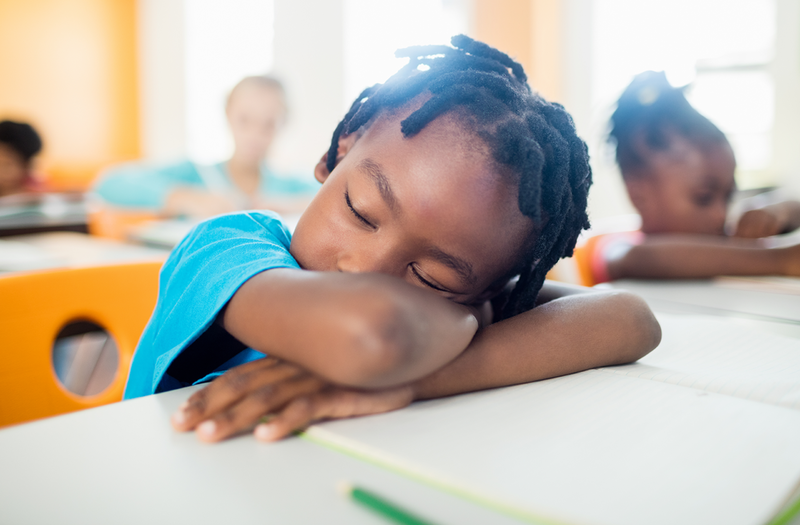 What can you do to help your child get the sleep they need? Set a good example for your kids by emphasizing the importance of a good night's rest and get some yourself. Limit screen time, especially with phones and tablet computers late at night. The blue light that's emitted from some of the larger screens can be enough to suppress your body's melatonin, the sleep hormone. If you must use a night light, a dim red light is best. Have a comfortable, safe, quiet bedroom, free of electronics such as phones, computer screens or TVs. Many parents have a set time and designated place for these items to be used a couple of hours ahead of bedtime so that there is time to unwind. Make sure your kids get lots of bright sunlight during the day. It helps improve mood and motivation during the day and helps everyone sleep better at night. Get lots of exercise, ideally outside. At least 60 minutes of moderate to vigorous physical activity each day is recommended. Avoid vigorous exercise two to three hours before bedtime as it may be over-stimulating (a relaxing walk after supper is great). Have a regular and relaxing bedtime routine - do the same things in the same order before you go to bed. Think about things that help you relax and wind down after the day (e.g., relaxing bath, good book, quiet play) and avoid highly stimulating activities. Ensure a healthy and well-balanced diet. Avoid eating too much before bed as it can cause discomfort and be overly stimulating. Watch for hidden caffeine (e.g., in colas or energy drinks). Keep a calm and happy tone in the home! Find healthy ways to manage stress during the day such as exercise or mindfulness, and look for help if you need it. Adapted from an article published in the Sept/Oct. 2016 edition of Wave.